Concrete - it’s an incredible construction material that has been in use for thousands of years. Many structures made with concrete can still be found standing today, from properties and commercial structures to the ingenious early radar warning system set up along Britain’s coastline. Not only durable, the versatility of concrete is one of its leading properties and today you can even find concrete used around the home, from outdoor chairs and tables to inside kitchens as worktops. Particularly beneficial in the restoration of historic buildings, concrete has a multitude of uses which continue to be developed. For example, the recent leaps in 3D printing homes with concrete. It is a low-cost solution that stands to be used in the construction industry for the foreseeable future. We can see evidence of the Ancient Egyptians using concrete-like compounds to build their homes and pyramids. Mud was mixed with straw to form bricks that were used to construct their shelters and houses, while gypsum and lime mortars were used as a bedding material to build the pyramids. In particular, the Great Pyramid of Giza is thought to have taken an estimated 500,000 tons of mortar to build – definitely no small achievement! Around a similar time period over in the East, China was using a concrete-like mortar (made using a type of sticky rice!) to build their boats and the Great Wall. Fast forward to Roman times. 300BC and concrete-like substances were used proficiently, although slightly differently to how we build today. Instead, Romans would stack stones and hand-fill the open gaps with mortar to construct their buildings and houses. The Pantheon, completed in 125AD during the Roman Emperor Hadrian’s reign, is the largest reinforced concrete dome ever built in history and is an amazing feat of concrete construction. Using concrete as a construction material was an art form that was sadly lost at the end of the Roman empire. Until 1678, there aren’t many instances of concrete-like substances used for construction. However, Joseph Moxon wrote of “a hidden fire in heated line” that appeared when water was added. 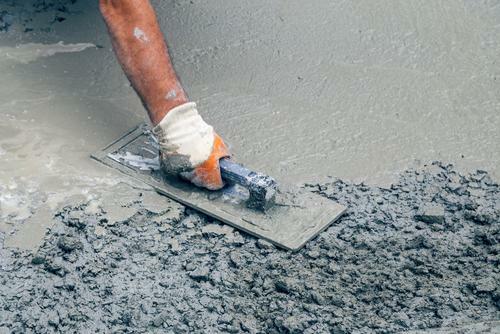 Later, in 1756, John Smeaton, an engineer in England, would rediscover hydraulic cement after tests involving different types of water mixed with mortar. From here, concrete was widely used, including patching up the Thames Tunnel (1828), building homes and shelters (France 1850-1880) and constructing sewer systems (London 1859-1867). Not long after this, Portland Cement started to make its way around the globe (1868, first shipment of Portland cement sent to the United States). While the make-up of concrete varied little over this time, reinforcement by use of “twisted bars” was later patented by Earnest L. Ransom in 1884. This reinforced method of construction was first seen in 1889 when the first concrete reinforced bridge was built, followed by the first reinforced concrete skyscraper in 1904. An explosion of concrete construction was seen over the next hundred years, from the tallest (at the time) concrete building built in 1922, followed by the first incredible concrete dams, Hoover Dam (which is still thought to be drying out today!) and the Grand Coulee Dam in 1936. Except for fibre reinforcement added to concrete in the 1970s, concrete saw little change from the 1950s through to today. Instead, countries started trying to build the tallest concrete structures, ending in the Burj Khalifa, which was constructed using the world's “largest concrete pour”. However, this record may have been recently broken by a Los Angeles skyscraper currently under construction. By technicality, the world’s “tallest concrete building” is officially the Trump International Hotel and Tower, located in Chicago. However, engineers debate this as having full “concrete construction” due to the implementation of a glass curtain. These are just some of the defining moments in the history of concrete construction on a reduced timeline and there are plenty more incredible buildings constructed using concrete that you should definitely look into. We hope that you’ve been enlightened about the history of concrete and how little it has been developed over the years. Quite incredible stuff when you consider it has been used for over 2,000 years now! If you would like to know more about the restoration of historic buildings or you have a concrete structure you need repairing, please get in contact with our experienced team on 01733 560 362.